Trout Release Day 2017 involved quizzes about subjects like bugs, Maine's watershed health, and of course, trout. You wouldn’t know it driving through the placid streets of Poland, Maine, but the area’s elementary schools are becoming hotspots for STEM education thanks to an engaging, hands-on ecology curriculum called Brookie Buddies. Over four months each school year, fifth graders in elementary schools across Maine monitor TTUs (total thermal units), PH, water quality, and track the fingerlings’ mortality rates. Daniella Mason, a fifth-grade teacher at the Poland Community School, says, “It’s important to monitor the tanks daily and report out to the whole class” so everyone knows how their fish are doing. “The kids are really invested in the success of the program.” Mason goes on to say that the program gives teachers a unique opportunity to get kids interested in trout life cycles and critical issues like water usage and conservation, overfishing, and pollution. “What we’re finding is that if kids develop an interest in science from a very early age, they’ll follow that path going forward… If kids don’t develop math and science skills by around fifth or sixth grade, they may be less likely to follow that path later,” says Heather Printup, a community relations manager at Poland Spring, who helped bring the program to participating schools. 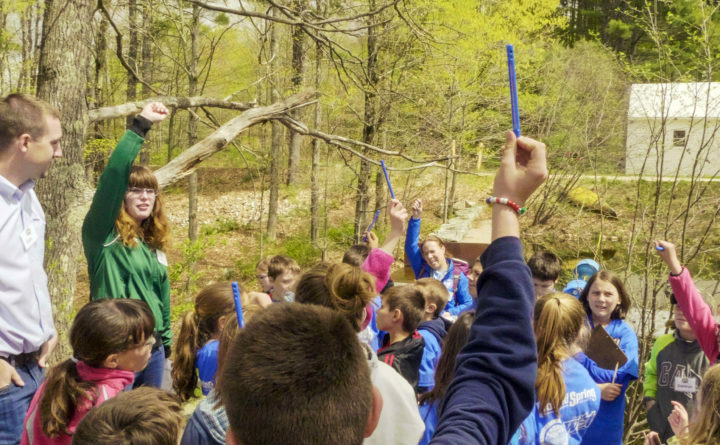 The program also teaches kids how to monitor Maine’s rivers’ and streams’ water quality using some of the same processes the Poland Spring® brand uses, like biomonitoring. “Downstream from our spring sites, it’s just as important that we maintain a healthy ecosystem. Biomonitoring plays a huge part in making sure the ecosystem is intact,” Poland Spring natural resource supervisor Mark Laplante explains. As part of the Brookie Buddies program, kids learn that macroinvertebrates (otherwise known as bugs) tell a story about the health of the water. How trout fare after their release depends on the health of the whole ecosystem, bugs especially, because as top predators in their environment, trout consume the entire food chain below them. At the end of their four-month curriculum, the students gather behind the Poland Fire Rescue Department for the trout release. Each student is given a cup to cradle, ladles in some water and then places a tiny brown trout into their short-term home. The children walk down a short dirt path to Waterhouse Brook reservoir and kneel by the stream to release their fry into the wild. A teacher points out that the trout are going to have to learn to swim against the current, and after introducing the fry to the wild, they disperse quickly, but a few linger, bravely fighting the stream.